A comprehensive tutorial for all owners of Premier+™ Ultra and Premier+™ Extra. 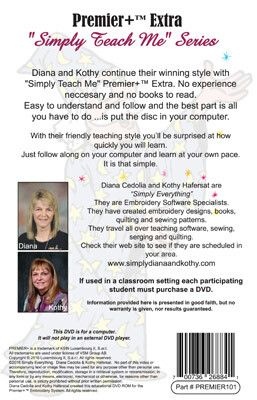 Diana and Kothy continue their winning style with "Simply Teach Me" Premier+™ Extra. No experience neccesary and no books to read. Easy to understand and follow and the best part is all you have to do ...is put the disc in your computer. With their friendly teaching style you’ll be surprised at how quickly you will learn. Just follow along on your computer and learn at your own pace. Over 12 hours of instruction in clear easy to understand steps. Includes a printable PDF index. Several "Practice What You Learn" exercises. Everything you need to take your skills from basic to beyond. The most effective way of learning Premier+™ Extra.